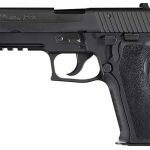 SIG just picked up a nice little chunk of business from the Franklin County Sheriff’s Office in Ohio: The department has selected the company’s P226 pistol as it’s official sidearm. In addition, the agency is going with the SIG M400 as its new patrol rifle. Meanwhile, the detective unit is going with the P239 handgun. Captain James Simmons of the Franklin County Sheriff’s Office, which is based in Columbus, Ohio, said this marks the first time the department is issuing a standard duty gun to every officer. Testing and transition of these guns was supported by Franklin County Sheriff’s Office Sheriff Dallas Baldwin. Widely used by military and law enforcement, the version of the P226 pistol going to the Franklin County Sheriff’s Office, the P226R, is equipped with an integral accessory rail for tactical lights. The gun also features a hard anodized aluminum black frame; black nitron-finished stainless steel slide; and a 9mm 15-round magazine. The presser describes the P239 as a compact 9mm gun with an aluminum frame and black polymer grips. The SIG M400 is an AR rifle with a free-floating M-LOK handguard; enhanced Mil-Spec trigger; SIG’s micro-light gas block; and a magazine capacity of 30 rounds. Local distributor Vance Outdoors in Obetz, Ohio is supplying the guns, SIG says. See the specs for each model below. For more on SIG, visit SigSauer.com. Excellent content provided by Tactical-Life.com. Legally licensed through the NewsCred publisher network. Please direct all licensing questions to legal@newscred.com.